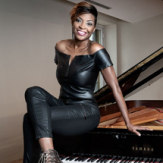 Jade Simmons has been inspiring audiences not only with her skills as a keynote speaker, but also as a classical concert pianist. Combining these elements of expression and story telling, Simmons is able to captivate audiences with her unique and one-of -a-kind artistry. Here’s why you should book Jade Simmons for your next event in just 30 seconds! Jade’s claim to fame involved Pushing Boundaries to see results, and that’s exactly what she teaches her audience to do as well. Through shifting your mindset, Jade encourages attendees to be bold in order to live a life full of purpose and impact. Through pushing boundaries, attendees will find ways to elevate themselves in their personal and professional lives. Ditch the status quo and Transform to Trailblazer with Jade. Her mission is to help motivate people make this transformation in order to reach new heights and achieve personal and professional success. Jade’s four main pillars of focus include: Purpose Discovery, Bolstering Boldness, Changing Master, and Cultivating Creativity. Simmons encourages participants to think of it as a buffet style and create a new you! Interested in booking Jade Simmons for your next event? Contact 1.800.345.5607 or visit eagles talent.com for more information. This entry was posted in Speaker Feature, Speakers Bureau Trends and News, Tips and Ideas and tagged 30 second recap, 30 second recap jade simmons, activist keynote speakers, african american keynote speaker, artist, Arts & Pop Culture, arts and pop culture speaker, best inspirational speakers, best inspirational stories, best motivational speakers, best ted conferences, best ted talks, best ted talks 2018, Bold, classical concert pianist, eagles talent, help tips and ideas, inspirational keynote speaker, Jade Simmons, jade Simmons speaks, microphone, one of a kind, piano, pushing boundaries, speaker, story telling, TED talk, the story teller with practical insights, tips and ideas, tips and tricks, trailblazer, transform. Bookmark the permalink.